A bit overcosted. Unsummon is U (and not that good), and an unconditional cantrip is traditionally 2 more. A regression with regards to Repulse. But not repulsive in regards to Regress. Symbol of Unsummoning is pretty weak, and Repulse is pretty strong, so this card seeks to find something in the middle. 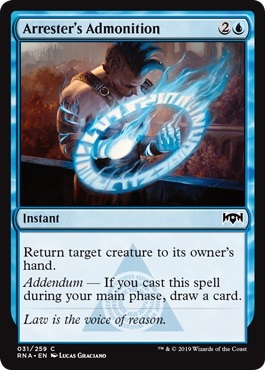 Addendum cards seem hard to really design, at least when it comes to making the instant speed version tempting. I don't think this card succeeds there, as people are going to want to draw the card a vast majority of the time.